The vehicle itself started back in the late 1950’s based upon the idea of using the hull of a Centurion tank and fitted with a BL 5.5 inch QF field gun (140mm howitzer) in a built up casemate on the hull. The idea was a good one offering commonality of automotive parts with the Centurion tank which was the main tank in service with the British Army at the time. A wooden mock-up of the vehicle had met with approval and two prototypes P1 and P2 were manufactured and underwent testing. 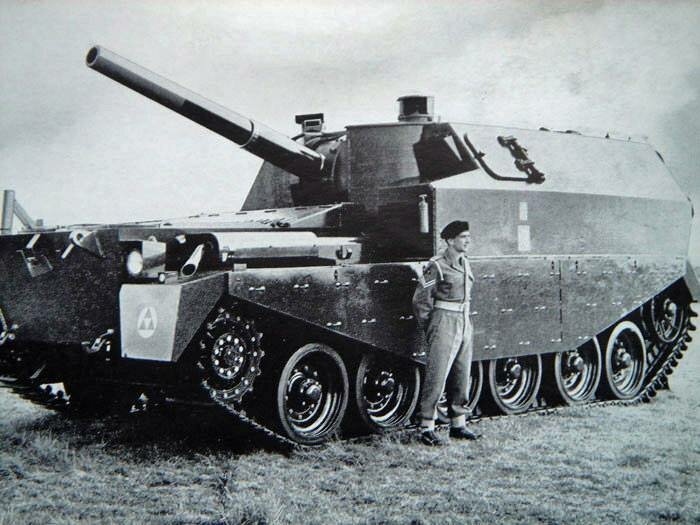 The project eventually lost out by the early 1960’s to the FV433 self-propelled gun known commonly as the ‘Abbot’ and both prototype Centurion FV3805 SPG P1 and P2 were thought to have been sold for scrap. 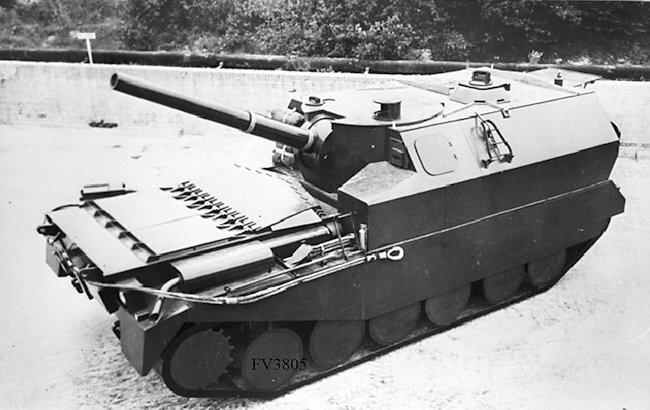 The Abbot was chosen because the FV3805 SPG was not air-portable and with NATO standardization of 105mm and 155mm guns the British 5.5 inch gun (140mm) was being made obsolete. With a limited traverse of the gun it was an inferior design to the smaller, lighter and more capable Abbot anyway. The vehicle is built ‘backwards’ very similar to the WW2 Archer 17pdr SPG. 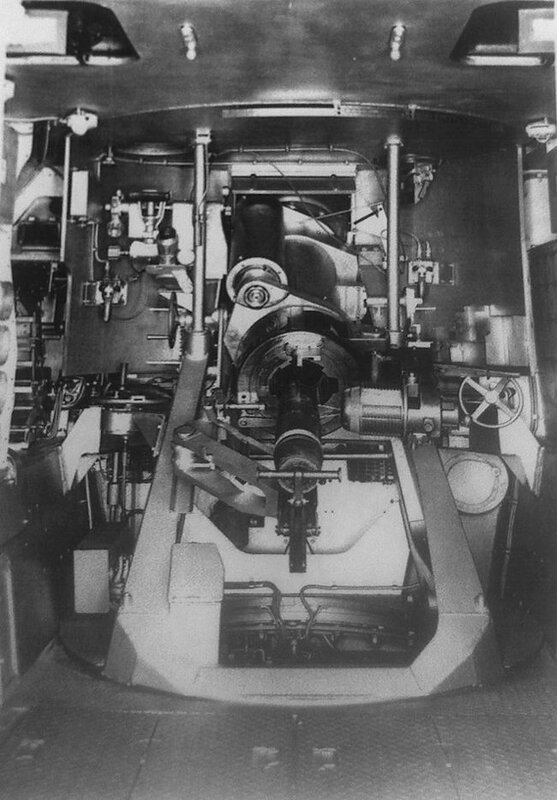 The engine and gearbox are at the front and the superstructure built over the front of the machine but facing over the engine deck so would have been driven with the gun facing backward. The driver position was moved to the center of the vehicle on the left side. This artillery field gun was produced between 1941 to 1945. It weighed 13,647 lbs (6,190kg) and had a barrel length of 13ft 9in (4.19m). Its caliber was 5.5 inch (140mm). It fired a high explosive HE shell that weighed 100 lbs (45.5kg) and a smaller one that weighed 82 lbs (37kg). The 100 lbs shell could be fired at a maximum range of 9.2 miles (14.81 km). The lighter 82 lbs shell could be fired at a maximum range of 10.28 miles (16.55 km). The letters BL stand for ‘breach loading’. It was fitted with a Welin breech and Ashbury mechanism with a hydro-pneumatic recoil system. It had a rate of fire of two rounds per minute. The 100 lb shell was fired at a muzzle velocity of 1,675 feet per second (511 m/s) and the 82 lb shell was fired at 1,950 feet per second (590 m/s). It fired two part ammunition. The high explosive HE shell was loaded first followed by the propellant charge canister that would have the correct amount of powder bags in it for the range of the target. It could also fire 100 lb smoke or colored flare marker shells. The normal HE fuze was No 117. In late 1944 a VT fuze T100 became available. This gun was first used in the deserts of North Africa in 1941. Most British, Polish and Commonwealth forces were equipped with this gun. The normal organization was an artillery regiment of 16 guns organized into two batteries. It continued to be used during the cold war in conflicts like Korea. It was purchased by many different nations. Both Pakistan and India used this gun in their border wars. 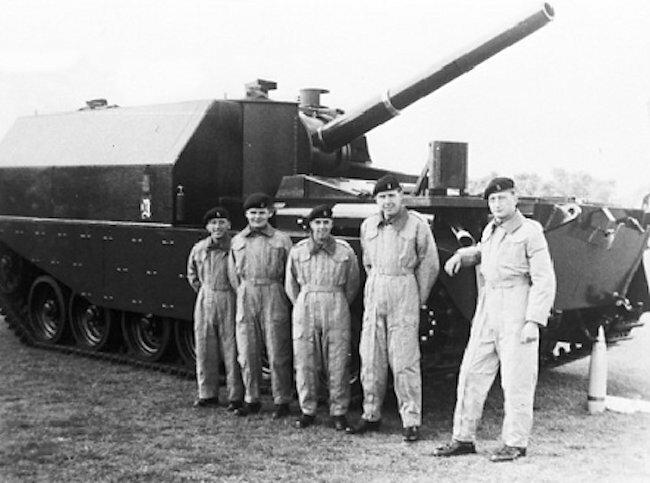 In the British Army it was replaced by the L121 FH-70 155mm towed Howitzer. It remained in UK service with Territorial Army regiments until 1980. The following information was found in an original document covering the ammunition stowage on the FV3805 SPG. (a) At least 25 HE rounds (fused) and 5 HESH (fuzed) are to be carried in the SP. It is desired to carry 35 HE and 5 HESH. 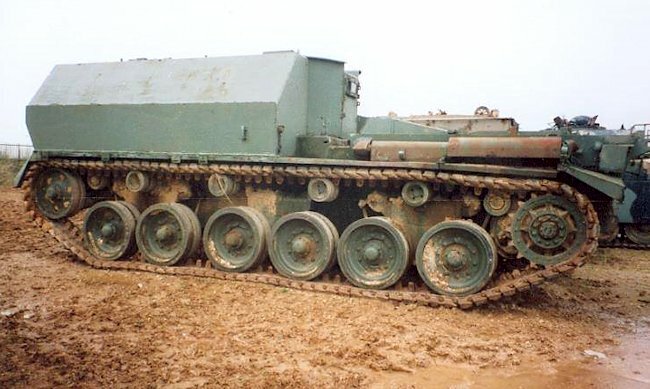 The following account is from Roger Walton who actually drove the Centurion FV3805 artillery SPG prototype whilst he was in the British Army: – In 1977 whilst serving in Northern Ireland I noticed a posting requiring a driver of tracked vehicles. I loved driving so I put my name down. In February 1978 I arrived at the Army MOD Shoeburyness and Foulness Defence Evaluation and Research Agency [DERA]* weapons testing complex, near Southend-on-Sea in Essex. It was not a glamorous posting. I was in a team of 3 drivers, a Lancer from the 16/5th, one from 3rd Royal Tank Regiment RTR and myself being Queens Own Hussars, plus REME and 120 gunners. It was my first time in a weapons proofing establishment and I was expecting to see loads of Chieftain tanks. My first Monday at the tank workshops I was horrified to learn that they only had one Chieftain, a rare mark one which was being used to calculate various things which the civilian boffins thought we didn’t need to know. Back at the workshops, I was introduced to a number of AFV ‘funnies’ used for towing, recovery and as gun platforms. 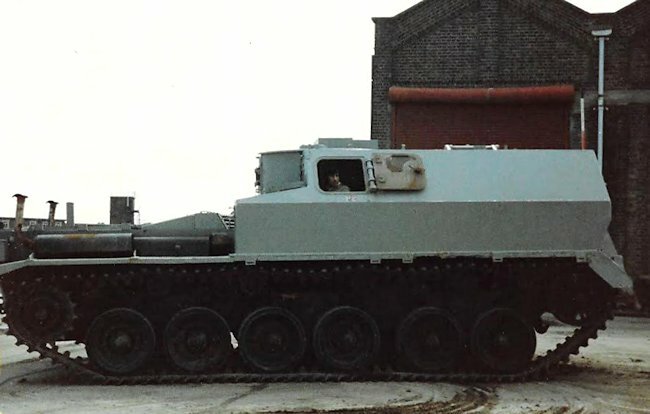 The Centurion FV3805 SPG was sat in yard. Never having seen this vehicle before I was keen to find out more so I asked after the beast. 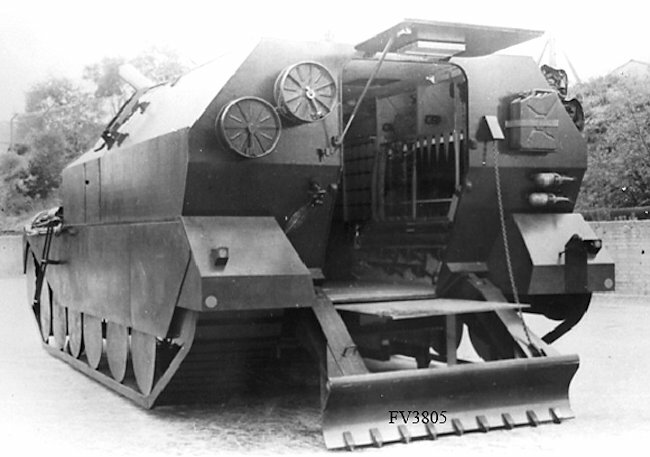 It was explained that it was a prototype and had been intended for the artillery. At this time it was a none runner fitted with a 105mm gun from an Abbot Artillery SPG. 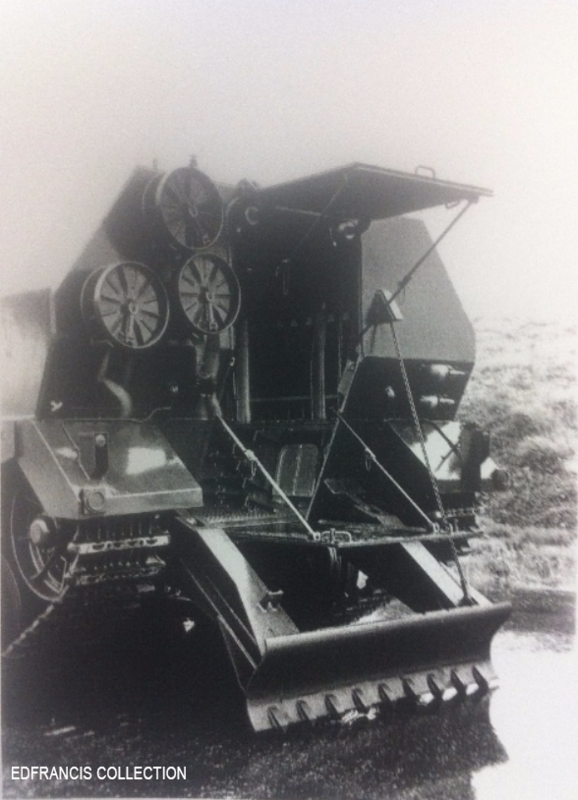 It was soon sanctioned by the powers that be to get it running so it could be used as an ammunition carrier whilst out on the sands firing range. It did not take long to get her back in a running condition. I soon learned the quirkiness of this vehicle. The engine and gearbox were what I normally found in an old Centurion tank, except the drive was all reversed. The gun was on a fixed/limited traverse facing over the engine decks. The driver sat to the left of the gun. The drivers control sticks, gear stick had all been shortened. It didn’t drive any differently to a normal Centurion tank, but I do remember having a limited view to the front. I was totally blind due to the gun being on my right. You could see bugger all to the right. Also due to the higher than normal driving position obstacles had to be carefully negotiated. As a driver you had a small hatch which you had to be careful using due to the height from the ground. The only obstacle on the base at this time was the sea wall. As you crested this we had to turn right to go onto the beach drive 100 yards or so to get onto the ramp onto the sands. It was being used to carry and store ammunition for other vehicles being tested at the base. I remember one time it being used to take ammunition onto the beach to supply an American M110 that was being put through tests. 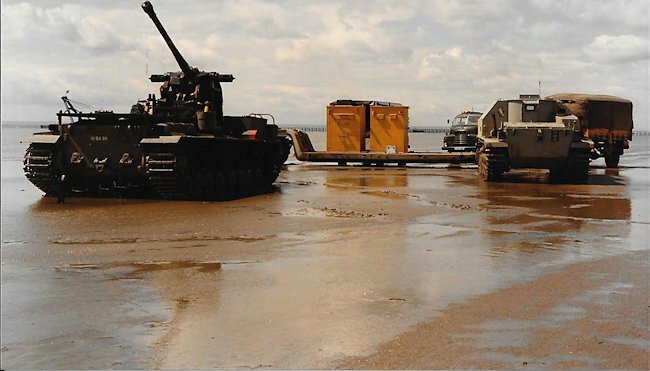 After delivering the ammo the FV3805 withdrew back down the beach during the live firing of range safety rules. 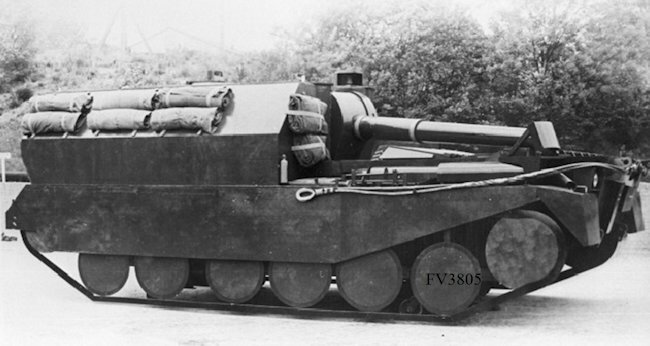 At some point, the 5.5 inch gun was removed from the prototype FV3805 and the vehicle was converted into an artillery observation vehicle to be used on the firing ranges. The holes left by the removal of the gun were blanked off with armor plate and an observation glass panel was added instead. It was painted light blue instead of the traditional British Army olive green so it was noticeable on the firing range. It was eventually transported to Duxford when it was no longer needed where it stood out in the rain, sun and snow for a number of years. 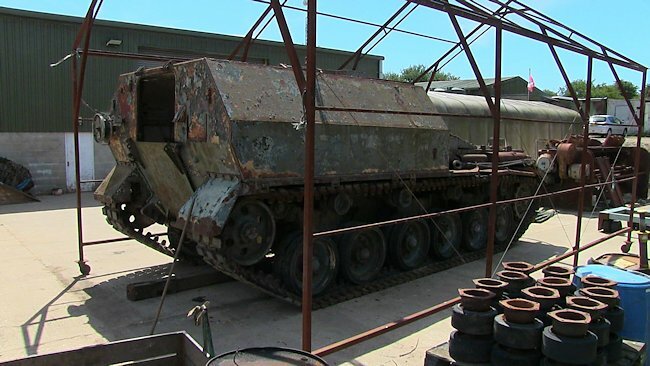 The Centurion FV3805 SPG P2 restoration project. 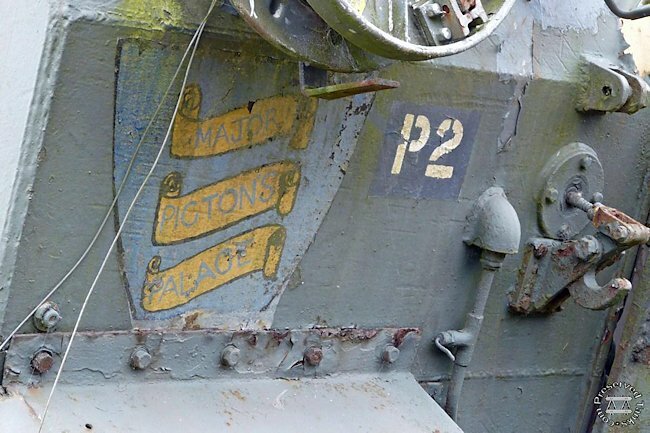 FV3805 P2 reappeared on the Isle of Wight, in Southern England at the Military Museum. Here she has sat outside in the salty air rusting away quietly and becoming rather sorry looking until 2015. Phase 1 of the restoration; moving the vehicle under cover to dry out has been completed. The next steps will be to organize the stripping of the paint and components from the tank for restoration. Phase 2 is getting the vehicle running. The biggest hurdle being the Rolls-Royce Meteor MkIVB engine which on inspection appears to be completely seized and likely is unrepairable. The gearbox is intact but needs an overhaul. The wheels and tracks are all complete. Phase 3 is fitting the gun. The gun itself is problematic. There is a lack of 5.5 inch guns for sale at the moment. At least 25 high explosive HE rounds (fused) and 5 HESH (fuzed) rounds are to be carried in the self-propelled gun. It is desired to carry 35 HE and 5 HESE. Wooden mock-up of the Centurion FV3805 artillery SPG. 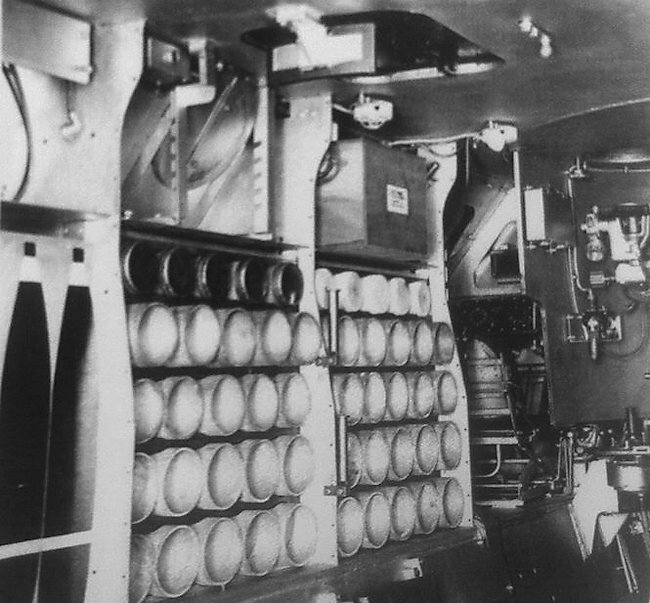 Notice the drivers escape hatch and vision slit to the left side of the 5.5 inch gun. 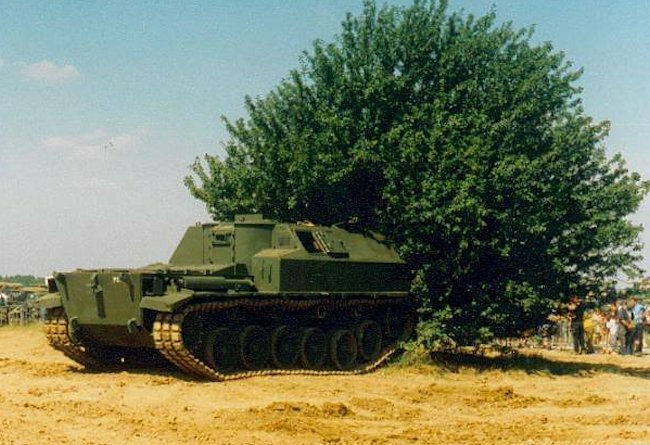 Centurion FV3805 artillery SPG prototype with limited travers ‘turret’ built inside a fully covered casement. 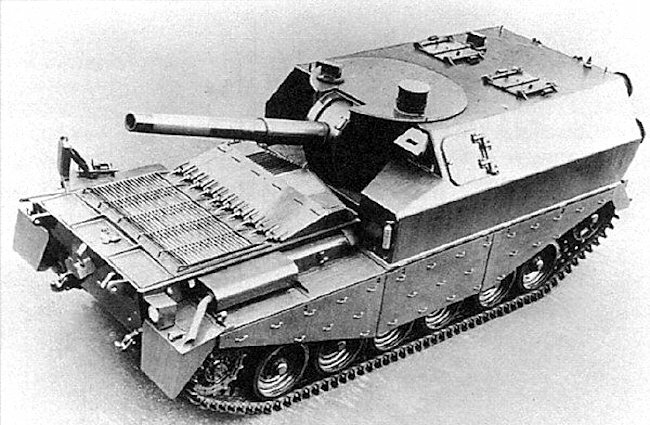 Centurion FV3805 SPG with the 5.5 inch gun at full elevation. 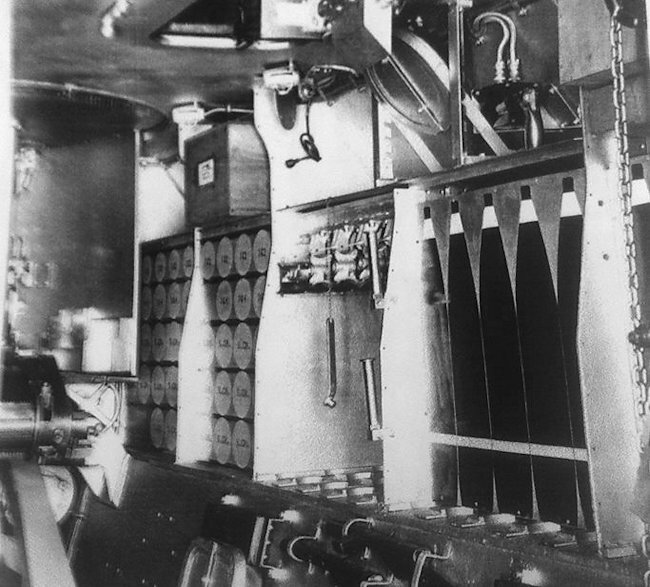 Centurion FV3805 SPG ammo storage racks on the right side of the vehicle. 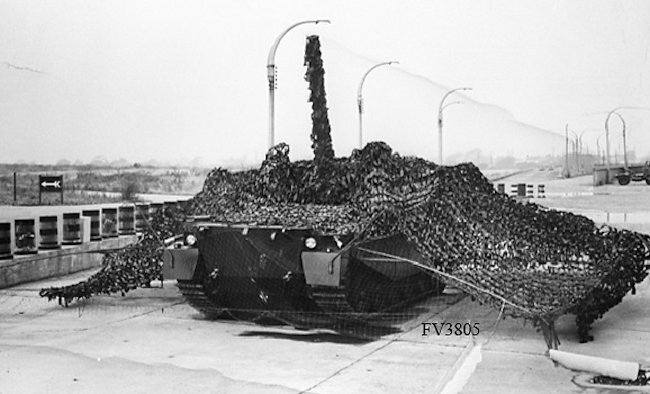 Centurion FV3805 artillery SPG in firing position at MOD Shoeburyness. 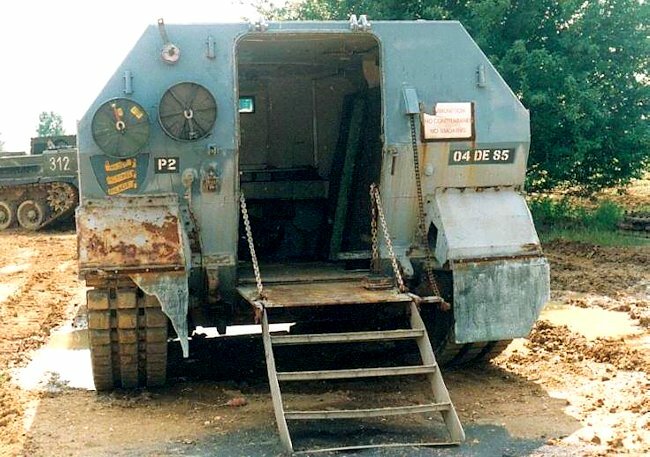 A photo of the Centurion FV3805 SPG showing the top/rear hatch intact and open. This photo confirms that the last remaining FV3805 Centurion PG was the P2 prototype. It is not known what happened to the P1. P2 was nicknamed ‘Major Picton’s Palace’. For many years Major Ian Picton was in charge of ‘A’ Section Trials and normally involved with Sands Shoots at MOD Shoeburyness. It was warm inside and was a good place to lurk on a rainy day. 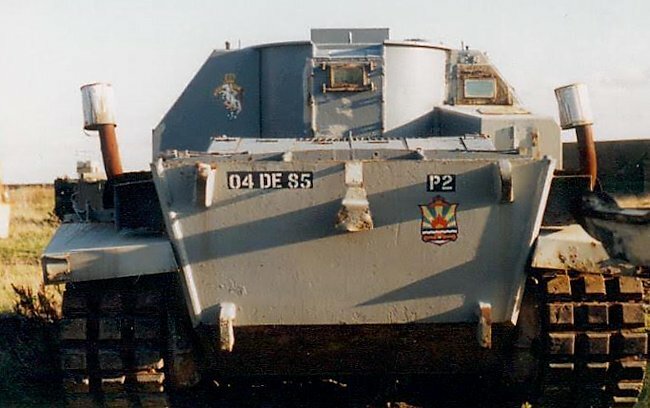 Because the Centurion FV3805 rear hatch is so large it is hoped that when the vehicle is restored to a running condition it will be the first AFV that can offer ‘tank rides’ to veterans and members of the public in wheelchairs. The Centurion FV3805 SPG was originally painted British Army Green. 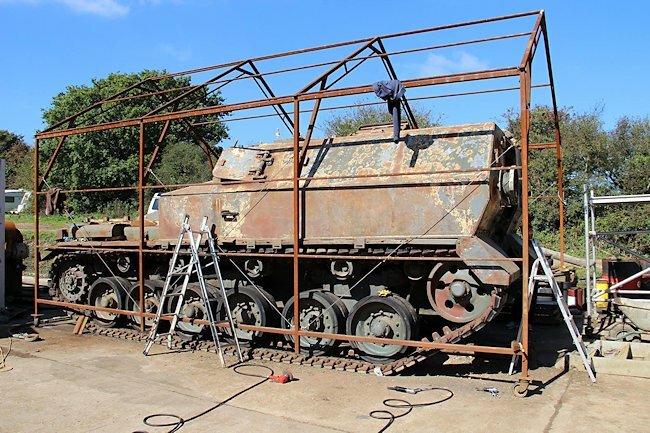 Centurion FV3805 SPG P2 under restoration on the Isle of Wight. Rate of fire 3 rpm for 10min or 1 rpm for 3 hours. Ammunition used 100 lb HE shell, 82 lb HE shell, 100 lb Smoke shell, 100 lb coloured flare shell. The Mighty Jingles? Jesus what a small world. Is the gun facing towards the rear of the chassis? 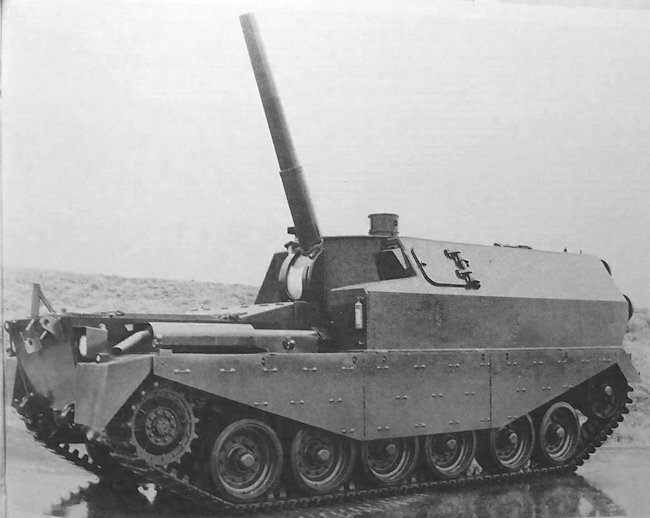 The other prototype was fitted with the Ordnance, QF, 25pdr. At the time, a field regiment of the Royal Artillery had 2 batteries (each with 6 guns) of 25 pdrs, and one with 5.5″ guns. NATO standardisation saw 105mm and 155mm being used, although US-built 155mm SPGs and SPHs were in use at the same time as 25pdr & 5.5″ combinations (towed regiments) until the end of the 1960s. Could you please send us these pictures to have a look at them?